A rare and fragile model of a river god made by Michelangelo Buonarotti in around 1525 has been restored to its original condition and placed on public view after years in storage. Made out of wood, clay, sand, wool and oakum fibers on an iron wire framework, the model was an ephemeral work. These were not built to last; models were use objects meant to be discarded after the permanent marble sculptures were finished. In this case, Michelangelo never did get around to making the sculpture, so the model is all we have to show for it. 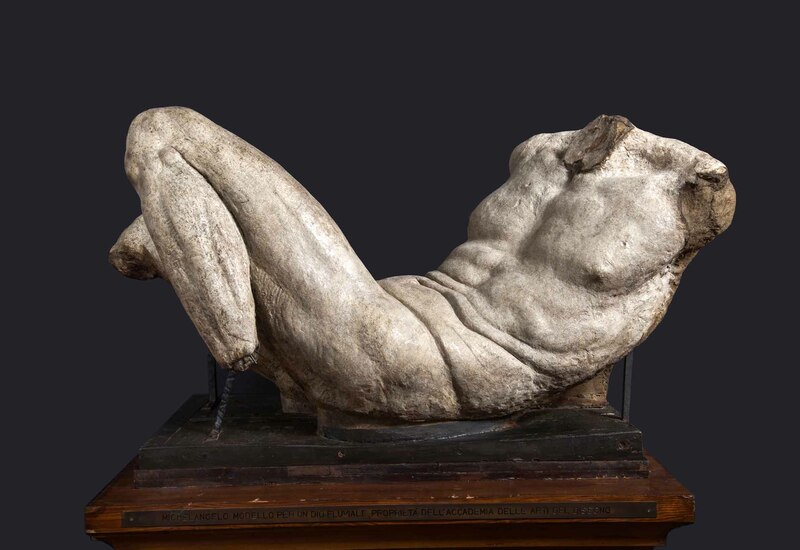 It is one of very few life-sized models ever created by Michelangelo. The statue in question was a river god or river allegory that was to recline on the right side at the foot of the tomb of Lorenzo de’ Medici, Lord of Florence, Duke of Urbino and the father of Catherine de’ Medici, Queen of France. 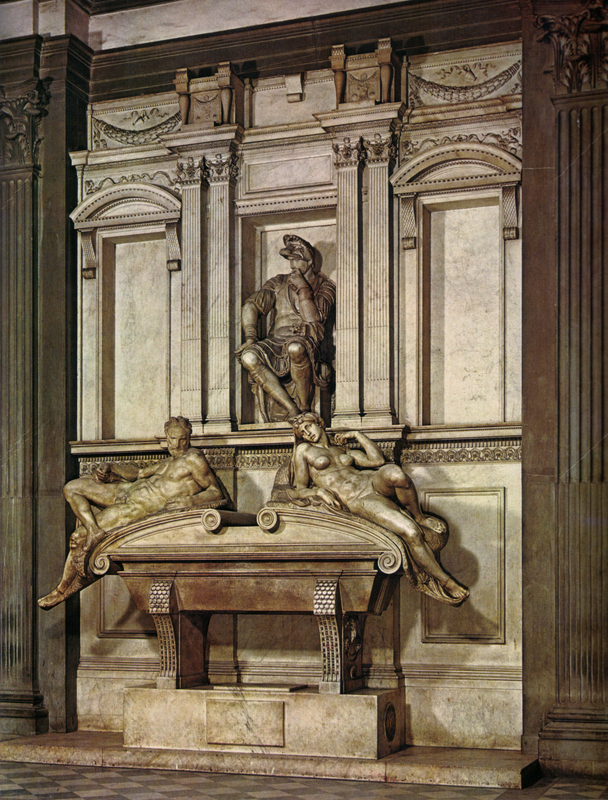 Michelangelo’s client, Pope Clement VII, insisted that he create life-sized models for the tomb sculptures in the (vain) hope that it would speed up production by allowing the master to delegate some of the execution to secondary artists without loss of quality. Another three river gods were planned for the base of the tomb, but Michelangelo only completed this model and the one for its twin on the left side. None of the finished sculptures of the river gods were ever made. 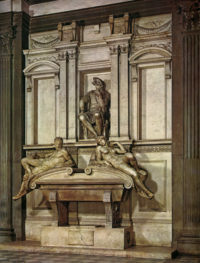 After he left Florence for Rome in 1534, the two models stayed in the New Sacristy of the San Lorenzo basilica, the grand chapel designed and sculpted by Michelangelo to house the palatial new Medici dynasty tombs, along with all the completed statuary. They were still there two decades later, but by the end of the 16th century, the right model was in the private collection of Cosimo I de’ Medici. The left model was lost. The only known version of it extant today is Michelangelo’s very rough work sketch in the British Museum. In 1583, the surviving model was donated to the Academy of Art and Design which is today the oldest fine arts academy in the world, founded by Cosimo I in 1563. At the time of the donation, less than 60 years after it was made, the model had condition problems. The first recorded restoration of the work took place in 1590. Over the centuries, the river god fell down an art historical memory hole until it was rediscovered in 1906 by German sculptor and long-time resident of Florence Adolf von Hildebrand and German art historian Adolf Gottschewski. The new attention the model received spurred the Academy to move it to the Galleria dell’Accademia where it was displayed near the David and other sculptures Michelangelo carved in marble. 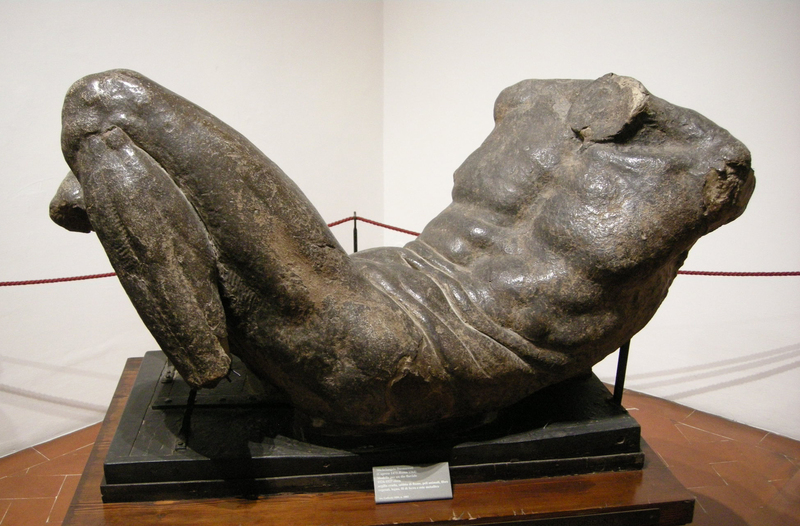 The model was on display there until 1965 when it was moved to the Casa Buonarroti museum for its own preservation and to add to the museum’s collection of Michelangelo models. The Academy still owns the piece, however, and three years ago they engaged the services of Florence’s top restoration masters at the Opificio delle Pietre Dure to stabilize the deteriorating model.They mended areas of the surface that had come apart and strengthened the structure to prepare it for future transport and exhibition. They also analyzed the dark paint that gave the work a bronzed effect and discovered it was a later alteration. Michelangelo’s original choice was the paint the model in lead white to make it look like the marble the finished product would be made out of and so that it would match the completed sculptures in the New Sacristy. Opificio conservators painstakingly removed the dark paint, revealing and restoring Michelangelo’s original white lead layer. The restored model made its official debut at the Refectory of the Basilica of Santa Croce on July 11th. In September it will go on display at a major exhibition on the art of 16th century Florence at Palazzo Strozzi. After that, it will be on permanent view at the Academy of Art and Design. This entry was posted on Saturday, July 15th, 2017 at 11:30 PM	and is filed under Museums, Renaissance. You can follow any responses to this entry through the RSS 2.0 feed. You can skip to the end and leave a response. Pinging is currently not allowed. The press coverage was notably vague regarding the location of the object at the time of the “presentation”. The Friends of Florence have been paying for the restoration of more or less everything in the Accademia, so their intervention makes particular sense if the object is going back there.